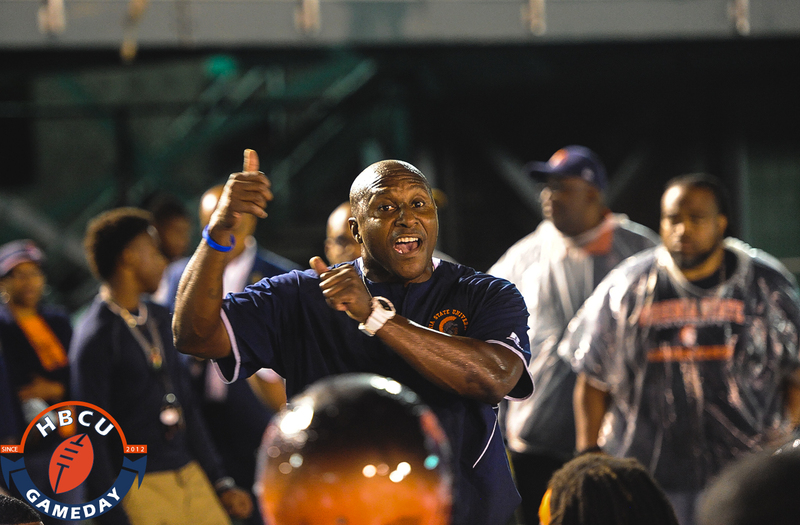 Reggie Barlow rewarded for his success with Virginia State by being named the CIAA Football Coach of The Year. Three years ago Reggie Barlow was booted from his alma mater despite running a consistently competitive and winning program. On Thursday the former Alabama State coach was named CIAA Coach Of The Year, according to Virginia State University. The CIAA has yet to officially announce Barlow as winner, but VSU’s athletic department issued this tweet with conference logos declaring its coach as the winner of the CIAA’s award. Barlow is certainly deserving of the award. VSU is currently 9-0, nationally ranked and appears to be a lock for the NCAA Playoffs. VSU is 18-2 in 20 games with the former NFL receiver at the helm. The team went 9-2 in his first season, narrowly missing the CIAA Championship Game and the playoffs. VSU has had a banner season so far, starting with a win over archrival Norfolk State in its opener and continuing with a thrilling 33-27 overtime win over Winston-Salem State in Week Four. The battle with Bowie State was another landmark victory, as VSU put up 47 points on one of the top-ranked defenses in the country and took control of the CIAA Northern Division. Finally, there was the CIAA-clinching matchup against rival Virginia Union in which VSU mounted another comeback for a 40-39 win to clinch its spot in the CIAA Championship Game. The unbeaten Trojans have been fueled by Trenton Cannon, who was named CIAA Offensive Player of The Year on Thursday, as well as quarterback Cordelral Cook. Cook, who originally signed with Barlow while he was at Alabama State, has been a true dual threat for VSU. He’s completed 58.6 percent of his passes and thrown nine touchdowns to just three interceptions. He ran for 17 touchdowns and averaged 7.7 yards on the ground as a dangerous compliment to Cannon. It’s been sweet redemption for Barlow, who was fired from Alabama State despite a 49-42 record at his alma mater after having been offered a contract extension only months earlier in 2014. VSU will take on Fayetteville State in the CIAA Championship Game on Saturday in Salem, VA.